Tomorrow we are having our annual cookie decorating party with family, so tonight Mason and I baked a batch of cut out cookies. As much as I hate the cut out part, I love the decorating (my sister makes the best icing) and the eating part. LOL. Mason LOVES to help me with stuff like this. Actually, Payton does too, but she tends to make more of a mess than anything. 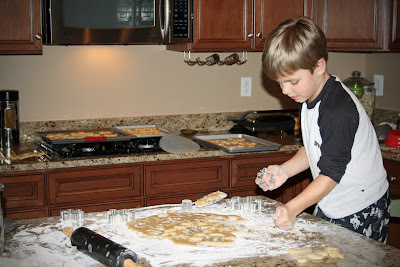 Mason also made some of his own cookies to send to his grandparents and great-grandparents. 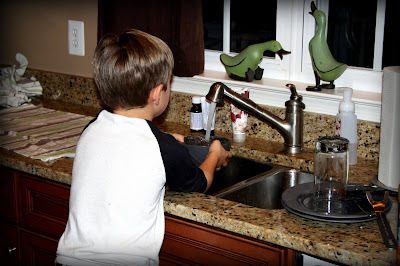 When we were cleaning up, Mason insisted on doing the dishes, another thing he LOVES to do. As soon as he learns that he isn't supposed to use the Bath and Body Works hand soap to wash the dishes, we'll be good.